Toss all ingredients in a large serving bowl. Serve at once or cover and refrigerate for up to 2 days. i love the idea of these two fruits coming together – sounds delicious. I like to eat this kind of salad. This looks Yummy!!! Thanks for sharing!!! 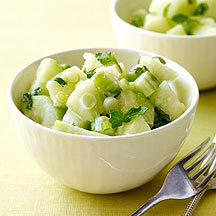 I love cucumber salad and I just made a short Video for a really popular recipe. It’s always a huge crowd pleaser. And it’s super easy to make! !